Typhoon Ompong, internationally named Mangkhut, made landfall on September 15, 2018. The 900-km wide typhoon carried winds of up to 205 kph, and traversed across four regions in Northern Luzon. According to the UN Office of Coordination for Humanitarian Action (UN OCHA), more than 1.6 million people were affected by the typhoon, most of which came from the farming population. By March, the NCCP emergency response, has reached a total of 6,975 families in 18 municipalities within 8 provinces across five regions. The humanitarian response is supported by the members of ACT Alliance. “Based on the results of our assessment, we opted to concentrate on food relief. We also focused on areas that were not immediately reached by the government nor other organizations delivering humanitarian assistance,” NCCP Emergency Response Lead Officer Almond del Rosario shared. The Council also provided assistance to isolated families affected by the consequent Typhoon Rosita in the province of Natonin, Mt. Province. It also responded to the needs of the Dumagat, the indigenous people in Rodriguez, Rizal affected by the monsoon rains pulled by Typhoon Ompong. Each food pack aims to provide a family-survivor food security for at least two weeks. On top of its standard food bag, faith-based group International Care Ministries supported our emergency response with a generous donation of 45,000 pieces of nutrient-enriched rice called Manna Pack. 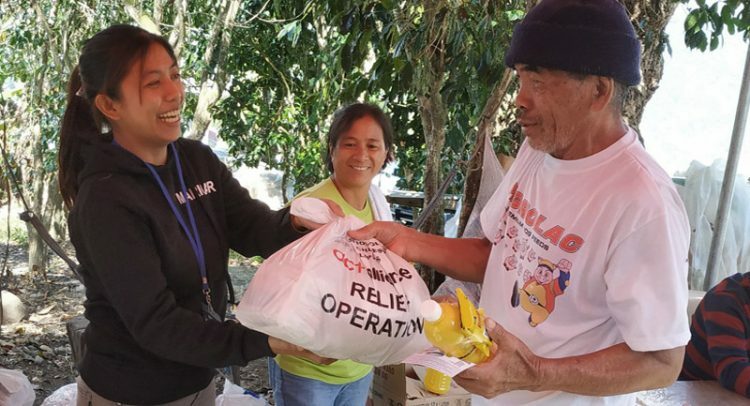 “We ensure this quality of food relief to help alleviate hunger and support the capacities of survivors to recover from the disaster,” del Rosario shared. “We ensure this quality of food relief to help alleviate hunger and support the capacities of survivors to recover from the disaster,” del Rosario shared. The poor farmers of Northern Luzon received the heaviest brunt of the disaster brought by Typhoon Ompong. The regions of Cagayan Valley, Ilocos, and Cordillera are among the top agricultural regions of the country. “At the time when Typhoon Ompong ravaged Northern Luzon, farmers in the Cagayan area were just a few weeks shy from harvest,” del Rosario recalled. Rice, corn, and vegetables are some of their main produce. As a result of the issues of landlessness and inadequate government support to the agricultural sector, Filipino farmers are among the poorest sectors in the country. “This vulnerability that Filipino farmers experience escalates even more in disaster situations. Some families scavenged for crops that were primarily meant as feeds for livestock for their family’s consumption after Typhoon Ompong swept through their farms,” del Rosario shared. 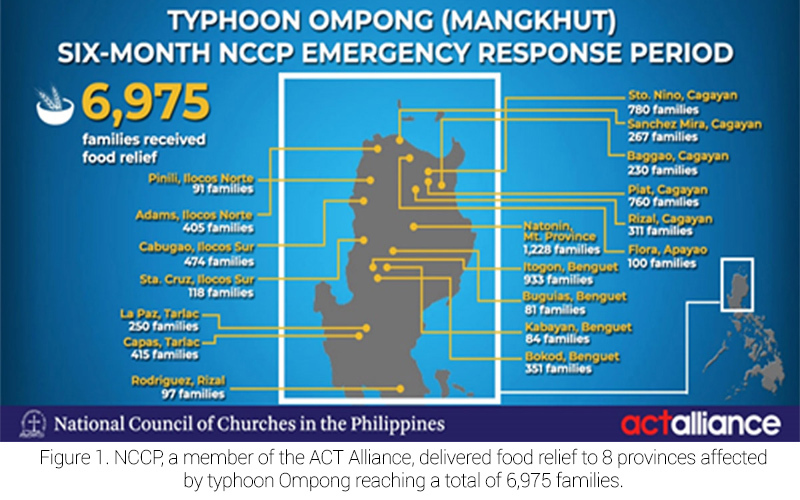 For the next months, the NCCP will continue providing support to the recovery of disaster-stricken communities through its agricultural assistance, which includes provision of seeds and farm tools. The Council also plans to help rehabilitate community water systems and repair shelters damaged by the typhoon. With the country’s high exposure to hazards such as typhoons and extreme weather events and stark physical, environmental and socio-economic vulnerabilities, the Philippines is extremely prone to disasters. As NCCP provides immediate relief and support for the recovery of disaster-affected communities, it also carries the advocacy for community-based disaster preparedness. 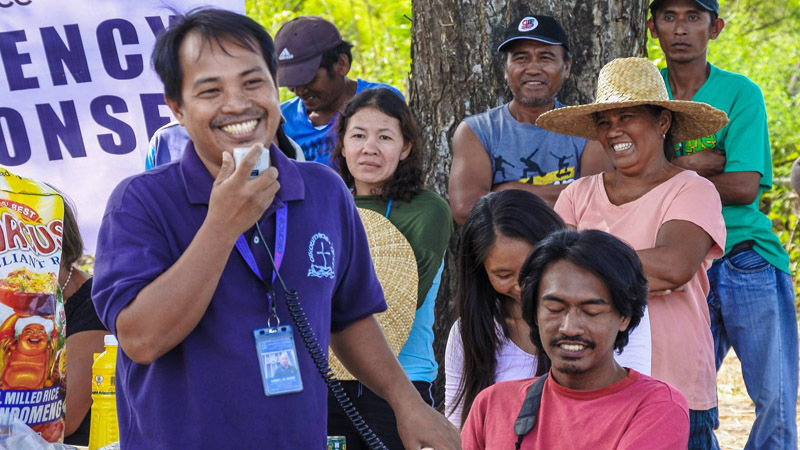 Together with churches, the Council partners with local government units to highlight the importance of community-based disaster risk reduction (DRR) in strengthening the resilience of communities. 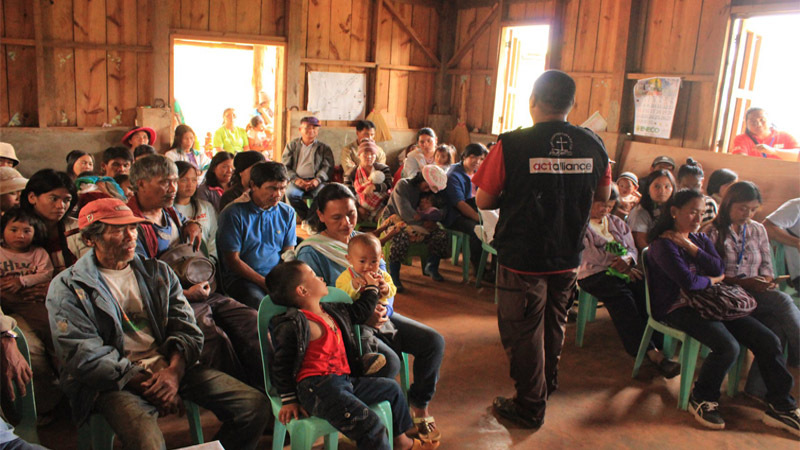 NCCP provides educational activities in locally-recognized high-risk areas to increase awareness in DRR, and reminds members of the community of their role in disaster preparedness. “It is important to recognize that each community has a capacity to be resilient, to be proactively prepared for hazards. Educational activities remind disaster-affected communities that each of its member has a role in creating a culture of disaster preparedness and resilience, from the residents to the barangay officials alike,” NCCP Education and Training Officer for DRR Patricia Mungcal said. “Typhoon Ompong came when we were just wrapping up our emergency response to the flooding caused by the monsoon winds in the various areas of Luzon. We were in Mindoro, an island in the southern part of Luzon, when Typhoon Ompong made landfall,” NCCP Humanitarian Response Manager Edward Santos recalled. “It is good that the church people, organized as regional Ecumenical Disaster Response and Management Committees, were active and alert at that time,” he added. All of the Council’s interventions in the affected communities were in partnership with its member churches that are organized in the affected regions: the Cagayan Valley Regional Ecumenical Assembly, Ilocos Regional Ecumenical Council, Regional Council in the Cordillera, Pangasinan and Central Luzon Ecumenical Assembly, other faith-based groups, volunteers and people’s organizations. “A strong partnership between the church and the community makes big tasks lighter. The presence of the churches in the community also serves as an inspiration to the community to unite and organize themselves, and move towards resilience,” Santos ended.